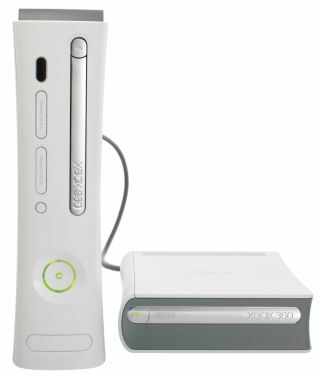 The Xbox 360 HD DVD drive - remember that? Xbox Live high definition movie downloads should take between 15 minutes and half an hour to download by the end of the year on some broadband services, according to Virgin Media and Microsoft today. A Virgin Media spokesperson informed us that the company's 50MB broadband service will be made available to over nine millions homes by the end of 2008 - over 70 per cent of Virgin Media's entire network. While exact dates and costings for the services are still to be announced, the spokesperson also informed TechRadar that full high def movie downloads, via services such as Xbox Live, should take around 15 minutes. An Xbox spokesperson gave us an estimate of "under half an hour". Either way, it beats the four hour plus wait which most of us currently have to endure on the service. Xbox Live subscribers are being treated by Microsoft this Easter, with an offer to download five top blockbuster movies being made available for 100 MS points (which equates to around 85p in earth money), specifically Transformers, Swordfish, Harry Potter: Order of the Phoenix, 1408 and Naked Gun 2 & 1/2: The Smell of Fear. "These five great movies, available to rent in both HD and SD formats, form part of the wider ongoing celebrations to mark our most successful year of Xbox Live yet," crows the Microsoft release. "We're proud to say that Live continues to be the premier service for streaming entertainment content into your home for all the family to enjoy. Xbox Live Video Store can be easily accessed via Xbox Live Marketplace and is the first video-on-demand service to be available in six countries: US, Canada, UK, Ireland, France and Germany." Most of the movies currently available on Xbox Live can be viewed in both standard and high-definition formats.